Be it quality (movies which are considered classic now) or quantity (biggest hits , most number of ATBB , ATHG) - Only 1 name come to everyone mind - Mr. Perfectionist Aamir khan..
SRK's consistency has been far better. He has atleast 1 film in top 3 and 2 films in top 5 in both the decades he has spent in bollywood, both collections(adjusted or non adjusted) and footfalls wise. Not a single film of aamir in Top3. 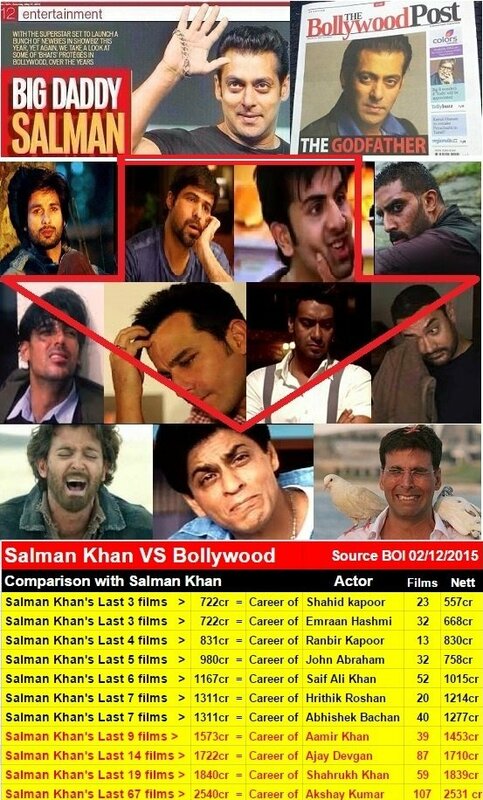 That is exactly what makes salman the greatest @srkwasim. Just imagine salman ki pichli 10 movies se aamir ka pure career nikal jata hai. Isse zyada sharmnaak baat kya ho sakti hai. He Isn't Called God Of Bollywood For No Reason. Proud Of You Aamir.. Content coupled with holidays! We see what it can do!